This deeply sensitive and powerful debut novel tells the story of a thirteen-year-old who is filled with self-loathing and must overcome internalized racism and a verbally abusive family to finally learn to love herself.There are ninety-six things Genesis hates about herself. She knows the exact number because she keeps a list. Like #95: Because her skin is so dark, people call her charcoal and eggplant—even her own family. And #61: Because her family is always being put out of their house, belongings laid out on the sidewalk for the world to see. When your dad is a gambling addict and loses the rent money every month, eviction is a regular occurrence.What’s not so regular is that this time they all don’t have a place to crash, so Genesis and her mom have to stay with her grandma. It’s not that Genesis doesn’t like her grandma, but she and Mom always fight—Grandma haranguing Mom to leave Dad, that she should have gone back to school, that if she’d married a lighter skinned man none of this would be happening, and on and on and on. But things aren’t all bad. Genesis actually likes her new school; she’s made a couple friends, her choir teacher says she has real talent, and she even encourages Genesis to join the talent show.But how can Genesis believe anything her teacher says when her dad tells her the exact opposite? How can she stand up in front of all those people with her dark, dark skin knowing even her own family thinks lesser of her because of it? Why, why, why won’t the lemon or yogurt or fancy creams lighten her skin like they’re supposed to? And when Genesis reaches #100 on the list of things she hates about herself, will she continue on, or can she find the strength to begin again? Edelweiss+ provided me a DRC of this book in exchange for an honest review.WE. NEED. MORE. MIDDLE. GRADE. BOOKS. LIKE. THIS.I know I've said it before, but I'll say it again: there are not enough middle grade books that feature African American girls and their day to day lives, along with some of the unique issues they face. This one was PHENOMENAL.Genesis deals with so many issues that children face--academic struggles, poverty, a parent struggling with addiction, making friends, racism. RACISM Edelweiss+ provided me a DRC of this book in exchange for an honest review.WE. NEED. MORE. MIDDLE. GRADE. BOOKS. LIKE. THIS.I know I've said it before, but I'll say it again: there are not enough middle grade books that feature African American girls and their day to day lives, along with some of the unique issues they face. This one was PHENOMENAL.Genesis deals with so many issues that children face--academic struggles, poverty, a parent struggling with addiction, making friends, racism. RACISM. Williams explores not only racism that exists between African Americans and other races, but also the prejudice that occurs within the black community. Are lighter-skinned blacks "uppity"? Are darker-skinned blacks judged unfairly? Genesis struggles to find love for herself while dealing with outside insult from people who claim to care about her. She hates her dark skin, her thick hair...in fact she has a whole list of things to hate about herself. My heart ached for her the entire book. I wish she could see some of the former students on my Facebook timeline--gorgeous girls who embrace their skin color and post amazing selfies with hashtags like #MelaninMonday.I love her friends Sophie and Troy, and I adore her music teacher. Her parents are complex characters that you both love and hate, and her experiences with "mean girls" will resonate with all girls--middle schoolers and anyone who's ever been one. This book went into my library's "to buy" cart before I was even halfway through. Genesis Begins Again is a raw, honest view of what it can feel like to be a young girl with a dark complexion trying to conform to society's beauty standards. In addition to the ups and downs, mostly downs, of middle school, Genesis must navigate life with an alcoholic, gambling father who destroys her sense of security every month. The book begins with Genesis feeling euphoric because she has made friends with the most popular girls in her grade. They have agreed to visit her home and they arri Genesis Begins Again is a raw, honest view of what it can feel like to be a young girl with a dark complexion trying to conform to society's beauty standards. In addition to the ups and downs, mostly downs, of middle school, Genesis must navigate life with an alcoholic, gambling father who destroys her sense of security every month. The book begins with Genesis feeling euphoric because she has made friends with the most popular girls in her grade. They have agreed to visit her home and they arrive to find all of the family's furniture and belongings sitting on the lawn. They had been evicted. Genesis stammers and tries to make up stories about the situation, but the girls ruthlessly mock her. Genesis must always begin again, new friends, new school, and new realizations. Why does her grandmother "hate" her dad? Why does her mom always forgive him despite the humiliation? How can she learn to love herself as she is? Genesis Begins Again tore me apart and pieced me back together. The dialog was so authentic, I felt like I was watching events unfold. As a person of Afro Caribbean descent, I could relate to the colorsim that Genesis and her father lived through. This is the first book for middle grade readers that addresses this issue honestly and fearlessly. The reader comes away understanding that Genesis is beginning to accept herself, but she has a long road ahead. I enthusiastically recommend Genesis Begins Again. This book is INCREDIBLE. My heart absolutely broke for Genesis as I read her story, thinking of all the amazing kids I’ve taught who might have felt that same self-loathing. This is a story that I hope will be a kinder mirror for those kids, showing them an honest glimpse of their own beauty, and an empathetic window for others. I was drawn right into Genesis’ story, feeling her conflicted emotions, her courageous triumphs, and her painful regrets. We need more books like this- own-voices books This book is INCREDIBLE. My heart absolutely broke for Genesis as I read her story, thinking of all the amazing kids I’ve taught who might have felt that same self-loathing. This is a story that I hope will be a kinder mirror for those kids, showing them an honest glimpse of their own beauty, and an empathetic window for others. I was drawn right into Genesis’ story, feeling her conflicted emotions, her courageous triumphs, and her painful regrets. We need more books like this- own-voices books by authors of color - I learned SO much from this book! This is an important book that deserves ALL the buzz and hype! Wonderful. We need more books like this for teens today. Genesis manages to be both wise and heartbreaking and - ultimately - uplifting. I'm sure her message will resonate with the intended readers of that age. I look forward to seeing more from Alicia D. Williams! Such such such a great novel. This one hit close to home in many ways. Genesis' voice feels authentic and has a power that is hard to describe. Alicia cunningly takes a girl going through really tough, emotional and painful life stuff, and yet hearing it through her voice, the voice of an ultimately optimistic 12 yr old makes the subject matter not seem as heavy. You don't feel like you need to take a break. With funny comments about the world around her and so much love for her family and frien Such such such a great novel. This one hit close to home in many ways. Genesis' voice feels authentic and has a power that is hard to describe. Alicia cunningly takes a girl going through really tough, emotional and painful life stuff, and yet hearing it through her voice, the voice of an ultimately optimistic 12 yr old makes the subject matter not seem as heavy. You don't feel like you need to take a break. With funny comments about the world around her and so much love for her family and friends. That is what this story is really about. Love. Loving family, loving friends, and loving yourself. Even when it's tough, and you have every reason not to. Even though you never fully find out what happens to Gen, and her loved ones, you still get a sense of completion. Like you can exhale and think they are gonna be alright, even if there are a few more bumps. Beautiful story Alicia. Find More Reviews On My Blog!This is a story about growing up, discovering your self-worth, and learning how to navigate complicated relationship. Genesis Begins Again is one of the best middle grade novels that I have ever read. I appreciated the fact that Williams did not hold back simply because she was writing a middle-grade novel. I want to put it in the hands of everyone of any age. I think a lot of young girls will really relate to Genesis’ story and her struggle to fit in when her comple Find More Reviews On My Blog!This is a story about growing up, discovering your self-worth, and learning how to navigate complicated relationship. Genesis Begins Again is one of the best middle grade novels that I have ever read. I appreciated the fact that Williams did not hold back simply because she was writing a middle-grade novel. I want to put it in the hands of everyone of any age. I think a lot of young girls will really relate to Genesis’ story and her struggle to fit in when her complexion makes her stand out. Genesis also faces struggles that other young readers may also be experiencing including having a parent who is an alcoholic, living in poverty, and having to constantly change schools and start over. I instantly felt a connection to Genesis, and actually found myself getting protective of her. I cried along with her and I cheered her on. It breaks my heart to know that there are real girls going through the same things as Genesis. I hope that this book finds its way into their hands and it gives them some hope. I will personally be purchasing a few copies to donate to my local library. That is how important I think this book is!I am in awe of Williams ability to write raw and honest characters, and I can not believe that Genesis Begins Again is her debut novel. I am anxiously awaiting to see what she comes out with next!Genesis Begins Again is coming out on January, 15th! Thank you Simon and Schuster Canada for sending me an ARC in exchange for an honest review. Raw, realistic and, at times, heart-breaking, this is a read which tackles a tough topic and gets under the skin.Genesis' excitement at finally having found friends crashes as their sudden visit to her home ends with the family's entire belongings on the front lawn. Thanks to her father, they've been kicked out of the house again, and her new found friends turn this into a chance to make even more fun of her. If the problems with her father and their family life weren't enough, they now are movi Raw, realistic and, at times, heart-breaking, this is a read which tackles a tough topic and gets under the skin.Genesis' excitement at finally having found friends crashes as their sudden visit to her home ends with the family's entire belongings on the front lawn. Thanks to her father, they've been kicked out of the house again, and her new found friends turn this into a chance to make even more fun of her. If the problems with her father and their family life weren't enough, they now are moving in with her grandmother who has a sharp tongue and a harsh attitude as far as Genesis' father is concerned, and claims it's due to his skin color—very dark black. That's Genesis' color too, and she hates herself for it. Especially since her mother and grandmother have such a beautiful skin tone. Genesis is determined to find a way to make herself lighter because she can't stand to be in her own skin anymore. Maybe then her life will turn around.This book starts with a scene which rips at the heart strings and continues to hit Genesis' life with a reality which bites. But then, that's how Genesis' life is and especially her perception of herself. The author lets the feelings lay open in their realistic harshness. That racism isn't simple and exists in every horrible variety becomes clear in these pages. It's a topic not often hit upon, and yet, one which also touches reality.Genesis does step on some dangerous territory as she goes to extremes to change her skin color...some moments made me hold my breath. Because of this, I would not recommend it to the younger spectrum of middle grade readers but see upper middle graders as well as tweens at a better place to process and understand what's going on. Sensitive readers might also have troubles with some moments. Otherwise, it's a read that induces thought and leaves an impression.The author makes sure to steer the entire thing in a healthy direction and leave the reader with hope and more understanding. It especially makes for a good read to lead to discussions concerning racism, bullying and self-worth. The four hundred pages is, unfortunately, on the heavy side for a middle grade read, especially one concerning such a heavy topic. This might make it a little less accessible to the intended age group.But these pages are definitely worth a read, and the tale hits a nerve, one which will leave the reader with plenty to think about long after the book has been laid down.I received a complimentary copy and was so drawn in that I wanted to leave my honest thoughts. Genesis keeps a list of things that she hates about herself. Some of it is the color of her skin and the way that others tease her about how dark she is, unlike her light-skinned mother with good hair. Some of it is about the way that their family keeps getting kicked out of the houses they live in because they don’t pay the rent. Some of it is the way her father speaks about her when he is drunk. Some of it is based on her grandmother’s hurtful comments about Genesis. So after being kicked out Genesis keeps a list of things that she hates about herself. Some of it is the color of her skin and the way that others tease her about how dark she is, unlike her light-skinned mother with good hair. Some of it is about the way that their family keeps getting kicked out of the houses they live in because they don’t pay the rent. Some of it is the way her father speaks about her when he is drunk. Some of it is based on her grandmother’s hurtful comments about Genesis. So after being kicked out of yet another house, Genesis’ family moves to a more affluent neighborhood outside of Detroit. Genesis discovers that she likes her new school and even finds herself making real friends for the first time. The house is the nicest they have ever lived in too. But other things aren’t any better. Her father keeps on drinking. Genesis is still as dark-skinned as ever, but she has plans to try to lighten her skin, thinking that will make her entire life better. 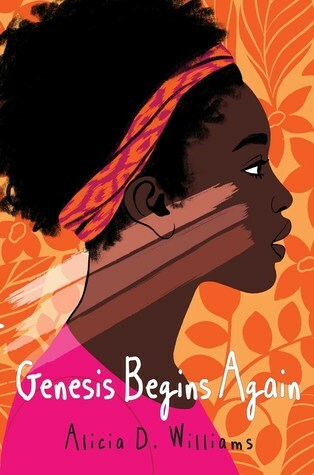 As Genesis discovers her own talents, she must learn that learning to accept herself is a large piece of moving forward in life.In this debut novel, Williams writes with a strong voice, taking on difficult topics including verbal abuse, racism, skin tone, alcoholism and co-dependency in an unflinching way. Williams reveals the deep pain and lasting scars that cruel words and verbal abuse can have on a young person, particularly when it is about a physical characteristic that is beyond their control. With Genesis’ parents caught in a marriage filled with anger and substance abuse, Williams offers other adult figures and also young peers who model a way forward for Genesis.Genesis’ growth is organic and well paced. She learns things steadily but has set backs that end up with her damaging herself. She is a complicated character who looks at life through a specific lens due to her upbringing. She is constantly judging others before they can judge her, placing distance where there could be connections, and making poor decisions when offered compliments. Still, she is a good friend, someone willing to look beyond the surface and see what others can’t. But only when she allows herself to do that. Her complexity is what makes this book really shine.Strong and vibrant, this book takes on the subject of skin tone in the African-American community as well as other heavy topics. Appropriate for ages 11-13. I was hooked by Genesis’ tone from page one, and knew she’d be a character I’d be rooting for when, 2nd page in, she sees her all her furniture out on the front yard along with some “friends” she’s trying to impress (remember this for later...)This is not new to Genesis: she’s had throw her things into trash bags and go sleep at Grandma’s, or on a mattress on the floor with strangers. You see, mom works for minimum wage while dad spends what earnings they have on alcohol rather than pay rent.For I was hooked by Genesis’ tone from page one, and knew she’d be a character I’d be rooting for when, 2nd page in, she sees her all her furniture out on the front yard along with some “friends” she’s trying to impress (remember this for later...)This is not new to Genesis: she’s had throw her things into trash bags and go sleep at Grandma’s, or on a mattress on the floor with strangers. You see, mom works for minimum wage while dad spends what earnings they have on alcohol rather than pay rent.For some kids, this is their normal.There’s no sugar coating the realities here, and on top of an already difficult situation is Genesis’ focus of wanting to change the color of her skin. Milk. Lemons. Bleach. Skin whitening cream. This, for me, was the toughest part to read because she does some scary stupid things to herself in search of lighter skin, but what it comes down to is her sense of self worth.“I did this to myself.”The book tackles several tough topics and had me holding my breath when Genesis began to build some positive relationships. I was certain it’d turn bad and am glad to see they were maintained, and flourished, to help her come to her new beginning. “I’ll tell you what beauty ain’t. It ain’t some organ hidden on the inside – no one cares about how good your heart is. And another thing, being black like me ain’t nothing to be proud about.”I haven’t been floored by a book in awhile. The story is full of such raw, and powerful moments that Williams artfully navigates. Ultimately, Genesis Begins Again is a story of acceptance: of wanting to be accepted by others, of learning how to accept yourself, of learning that you can refuse to accept the “I’ll tell you what beauty ain’t. It ain’t some organ hidden on the inside – no one cares about how good your heart is. And another thing, being black like me ain’t nothing to be proud about.”I haven’t been floored by a book in awhile. The story is full of such raw, and powerful moments that Williams artfully navigates. Ultimately, Genesis Begins Again is a story of acceptance: of wanting to be accepted by others, of learning how to accept yourself, of learning that you can refuse to accept the behavior of others and love them anyway. It is also about a young black girl learning how to feel comfortable in her own skin in a world that tells her she shouldn’t. Genesis’ journey is heartbreaking, and honest. But it’s also funny, and developed, and full of references to Doctor Who. This is the story that every kid, but especially girl, and especially especially black girl, deserves to read. content warnings: colourism, (internalised) racism, bullying, alcoholismThis book is going to be so so important for so many young people and I really hope it reaches a wide audience. It's unflinching, it dares to confront tough topics and it bravely and accurately depicts the anxieties of a modern teenage girl. I adored Genesis, and whilst she felt slightly mature, she also made choices which were completely in line for a character of that age which made her seem more realistic. She was complet content warnings: colourism, (internalised) racism, bullying, alcoholismThis book is going to be so so important for so many young people and I really hope it reaches a wide audience. It's unflinching, it dares to confront tough topics and it bravely and accurately depicts the anxieties of a modern teenage girl. I adored Genesis, and whilst she felt slightly mature, she also made choices which were completely in line for a character of that age which made her seem more realistic. She was completely nuanced and my heart ached for her as she struggled with trying to fit in in a world that seemed to be lighter skinned than she was.Read this for a complex, well-developed main character. Read this for important representation. Read this for multi-dimensional supporting characters. Read this for a story that deserves to be told. This is an emotional story about a young girl who learns to love herself.Genesis goes on a journey throughout this book. She starts out with friends who bully her and her family being evicted. She has to learn to love herself, but she makes many mistakes along the way, such as changing her hair, choosing the wrong friends, and even bleaching her skin.Genesis is also bullied by her father. It was heartbreaking to see how her father yelled at her and put her down because she had his dark skin inst This is an emotional story about a young girl who learns to love herself.Genesis goes on a journey throughout this book. She starts out with friends who bully her and her family being evicted. She has to learn to love herself, but she makes many mistakes along the way, such as changing her hair, choosing the wrong friends, and even bleaching her skin.Genesis is also bullied by her father. It was heartbreaking to see how her father yelled at her and put her down because she had his dark skin instead of her mother’s light skin. It was really difficult to read at times. Her strength was put to the test with all of the abuse, and she can’t be blamed for the things she did.This book really tugged at my heart. It is an emotional, but powerful, story.I received a copy of this book from the publisher via NetGalley in exchange for an honest review. An intimate portrait of the life of a 13-year-old girl who struggles with self-loathing. She is part of an intact family, but where do you cross the line from keeping the family together to putting the father's needs above the child's? Unfortunately the faith in her grandmother's life does not translate into the love and support Genesis needs. The world Genesis lives in is unfamiliar to me and this novel opens my eyes to the struggles of young women like her. Many young tweens and young teen gir An intimate portrait of the life of a 13-year-old girl who struggles with self-loathing. She is part of an intact family, but where do you cross the line from keeping the family together to putting the father's needs above the child's? Unfortunately the faith in her grandmother's life does not translate into the love and support Genesis needs. The world Genesis lives in is unfamiliar to me and this novel opens my eyes to the struggles of young women like her. Many young tweens and young teen girls will be able to relate to Genesis and root for her. Loved this book! The writing had me from page one. It only took me a couple of days to read. But I’m afraid it might not be picked up by a middle schooler due to being 364 pages long or a teacher to read to her class due to its length. This is a mighty, great read! This is one of the best middle grade books I've read in a long time. The voice is compelling and it guides the reader through some difficult topics and lands them safely in a good place. I am grateful this book exists, and it's going to change the lives of some of the kids that read it. Seriously stunning. This story hits on so many important things that deal with identity, belonging, and loving yourself. I can’t wait to hand this to my girls. I really enjoyed this one. Genesis' list of the things she hates about herself just ripped me up. Seeing her grow in self love and figure things out was a journey I was glad to be on. E ARC from Edelweiss PlusGenesis' family often falls on hard times. Her father has an industrial job, her mother cares for the elderly, and they have been evicted from four different homes in the Detroit area. During the last eviction, Genesis had brought home girls from school whom she hoped to impress, but this of course backfires. Her father, who is an extremely problematic alcoholic who is not very kind to Genesis, surprises her and her mother with a fancy house he has rented in the wealthy E ARC from Edelweiss PlusGenesis' family often falls on hard times. Her father has an industrial job, her mother cares for the elderly, and they have been evicted from four different homes in the Detroit area. During the last eviction, Genesis had brought home girls from school whom she hoped to impress, but this of course backfires. Her father, who is an extremely problematic alcoholic who is not very kind to Genesis, surprises her and her mother with a fancy house he has rented in the wealthy suburb of Farmington Hills. While she likes the new place, Genesis worries that they can't possibly make the rent, and she also worries about going to the new school with predominately white students. Genesis is very dark complected, and is self-conscious in the extreme about this, especially when other students call her names such as "Charcoal" and "Eggplant". She also doesn't like her hair. Her mother is very light, and her grandmother seems to blame all of the father's problems on his dark complexion, and makes it very clear to Genesis that her mother would have done better for herself had she married a man with a skin tone closer to her own light one. As a result, Genesis tries a lot of dangerous ways to lighten her skin-- scrubbing it raw, using lemon juice, and even pouring bleach in her bath. Luckily, at her new school she is able to make friends with Sophia, who has trouble with other students because of the way her OCD manifests itself. She is also glad to find a friend in Troy, a self-proclaimed "black nerd" who is as dark as she is and is tutoring her in math. Genesis thinks she has a friend in Yvette, who invites her to sing with her group in the talent show and who relaxes Genesis' hair, but in the end, Yvette is not as supportive as she seems. The family is in danger of losing their house yet again, and there are destructive secrets being kept, but in the end, the family is able to work together to get back on the right track. Strengths: There are very few books dealing with perceptions of black complexion (I can only think of Flake's The Skin I'm In (2007) and Magoon's Camo Girl (2011)), and it's good to see a new one. The feeling of Detroit and its environs is very strong and well done. Genesis' attempts to solve her family's difficult problems are heartbreaking, but also very realistic. It's nice that she has a supportive teacher at school. While the conversation about complexion with her grandmother is cringeworthy, it's also historically accurate and very interesting. It's good that Genesis' mother has a more modern approach to the question.Weaknesses: Skin color prejudice within ethnic populations is something I know nothing about, so it seemed a bit odd and unnecessarily mean to me. It did seem a bit odd, however, to have Genesis' father, who was a very, very poor example of a father, be the one with the very dark skin. It would have been much more interesting to have him have the lighter complexion, and the opinionated grandmother to be the one who was darker! What I really think: Definitely purchasing a copy, although I wish it were a little shorter. It's definitely a middle school book, but 400 pages is about twice the length that the average middle school reader is apt to pick up willingly! This book is INCREDIBLE. My heart absolutely broke for Genesis as I read her story, thinking of all the amazing kids who might have felt that same self-loathing. This is a story that I hope will be a kinder mirror for those kids, showing them an honest glimpse of their own beauty, and an empathetic window for others. I was drawn right into Genesis’ story, feeling her conflicted emotions, her courageous triumphs, and her painful regrets. We need more books like this- #ownvoices books by #authorso This book is INCREDIBLE. My heart absolutely broke for Genesis as I read her story, thinking of all the amazing kids who might have felt that same self-loathing. This is a story that I hope will be a kinder mirror for those kids, showing them an honest glimpse of their own beauty, and an empathetic window for others. I was drawn right into Genesis’ story, feeling her conflicted emotions, her courageous triumphs, and her painful regrets. We need more books like this- #ownvoices books by #authorsofcolor - I learned SO much from this book! Librarians, parents, and teachers of kids (especially those in 5th-8th grade): READ this book, add it to your library, and share it with young people - and not just those who are Black. This is eye-opening for kids of all colors, but especially white kids who may have no idea that their peers have these kinds of internal and external struggles. This is an important book that deserves ALL the buzz and hype!